These guidelines could be freely accessed and download from the site of the International Treaty on Plant Genetic Resources for Food and Agriculture. This latter is a FAO initiative for sharing knowledge and resources about the conservation and sustainable use of all plant genetic resources for food and agriculture and the fair and equitable sharing of the benefits arising out of their use, in harmony with the Convention on Biological Diversity, for sustainable agriculture and food security. The sustainable use of plant genetic resources for food and agriculture is one of the three main objectives of the Treaty, which devotes Article 6 to it. The International Treaty on Plant Genetic Resources for Food and Agriculture (the Treaty) brings a number of legal issues that require better identification of germplasm samples . For example, holders of germplasm in the Multilateral System (MLS) are encouraged to declare what material they have available. Providers are required to report what they have provided and to make available passport data and other associated non-confidential information. Recipients are required to make available the same type of information arising from their use of the material. In cases of dispute, the FAO may be required to investigate the transfers and use specific samples. Inclusion of material in the Treaty’s MLS is based on samples, not on cultivars or on any other assemblage of entities. The Treaty's truly innovative solution to access and benefit-sharing is its declaration that 64 of our most important crops - crops that together account for 80 percent of all human consumption - will comprise a pool of genetic resources that are accessible to everyone. On ratifying the Treaty, countries agree to make their genetic diversity and related information about the crops stored in their gene banks available to all through the MLS. This gives scientific institutions and private sector plant breeders the opportunity to work with, and potentially to improve, the materials stored in gene banks or even crops growing in fields. By facilitating research, innovation and exchange of information without restrictions, this cuts down on the costly and time consuming need for breeders to negotiate contracts with individual gene banks. Those who access genetic materials through the Multilateral System agree that they will freely share any new developments with others for further research. According to Resolution 3/2015 (adopted by the Governing Body at its Sixth Session in 2015), GLIS “integrates and augments existing systems to create the global entry point to information and knowledge for strengthening the capacity for PGRFA conservation, management and utilization". This vision is translated into seven objectives and a programme of work with concrete activities for the period 2016-2022. 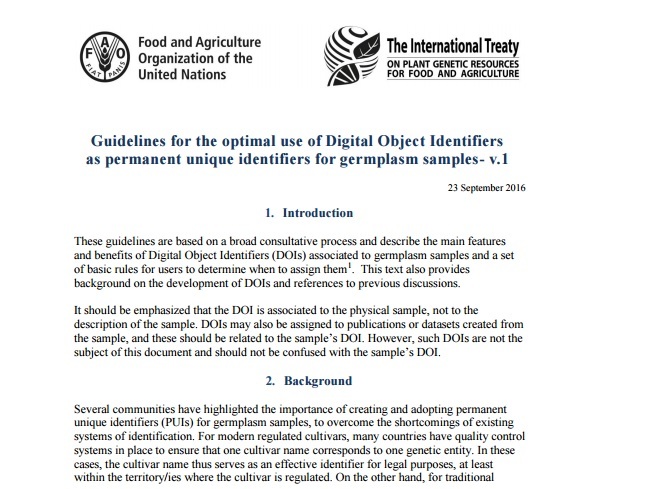 These guidelines (v.1) are based on a broad consultative process and describe the main features and benefits of Digital Object Identifiers (DOIs) associated to germplasm samples and a set of basic rules for users to determine when to assign them. As a result of the analysis “Global survey on descriptors required to register material in the Global Information System” (Report of the survey, FAO, 2015) DOIs were selected as the best technical option to identify the minimum set of descriptors required. The Report of the survey showed that there was a strong consensus on a strategic key set of descriptors to be considered mandatory and few more to be proposed as highly recommended.